Kaapana does not spell his name with an okina as shown on the cover of his latest album, but in all other respects this is an excellent follow-up to last year's "Kiho'alu: Hawaiian Slack Key Guitar." While that album was a 2006 Grammy finalist in the "Best Hawaiian Music Album" category, this new album is an even better showcase for him. Hawaii fans know that Kaapana is an accomplished falsetto vocalist as well as a slack-key master, and he sings on seven of the 12 selections here. As for Kaapana's promotion to "grandmaster" by producer Milton Lau -- a step above the rank accorded the participants in George Winston's "Hawaiian Slack Key Guitar Masters" series -- he is certainly worthy of the accolade. The sections are primarily Hawaiian standards such as "Kaulana Na Pua" and "Fireman's Hula." "Ka Wai Lehua A'ala Ka Honua," written by Kawaikapuokalani Hewett, represents the work of contemporary Hawaiian composers. "Lemon Tree" adds a mainstream pop oldie to the collection. Kaapana redefines the Peter Paul & Mary hit as a slack-key instrumental that puts the familiar melody in a fresh context. "Led-Heads" and others who enjoy the more showy side of his repertoire will enjoy the live recording of "12th Street Rag" that closes the album. 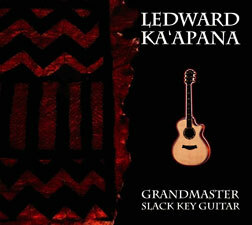 Local guitar virtuosos have been using the song as a show stopper for years, and Kaapana blazes through it here. Producer Lau completes this important release by including the Hawaiian lyrics of the songs Kaapana sings and the slack-key tunings for all of them. But there is an error in the composer credits: Lorenzo Lyons wrote the lyrics for "Hawai'i Aloha," but the music was composed by James McGranahan. In the two years that there has been a Grammy Award for "Best Hawaiian Music Album," albums with the words "slack key" in the title have won both times. That might explain the lengthy title of Paul Togioka's second album, although producer Milton Lau can't be blamed for keeping commercial considerations in mind. Why not make it easy for Grammy voters to gravitate to this one? Togioka and his studio sidemen craft beautiful instrumental arrangements of familiar melodies and original compositions alike. Opening the album with the Beatles song establishes the pop appeal of the album as a whole. "He Aloha Mele" and "Moonlight Lady" are two other instant favorites. 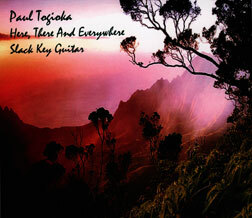 Nothing is said about the things that inspired the four originals, but Lau includes Togioka's slack-key tunings. That's a plus! "King of the Hawaiian Steel Guitar"
Hoopii was one of the greatest steel guitarists of the last century. That fact alone makes this long-awaited anthology a welcome one. Producer Harry B. Soria Jr. reintroduces his work with a random selection of 20 recordings made between 1927 and 1936. 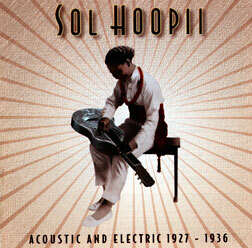 Hoopii made musical history in '27 when he switched from an acoustic steel guitar to a National Tri-Cone instrument. His sound and style changed again when he began playing a Rickenbacker electric steel in 1934. He was a trendsetter on both. Soria is well known for his detailed annotation, and the liner notes here is everything a buyer could ask for. Hoopii made enough recordings for Columbia and Brunswick that a second anthology is possible. With luck, Cord and Soria will be able to reissue Hoopii's earlier recordings for the Sunset label, as well.